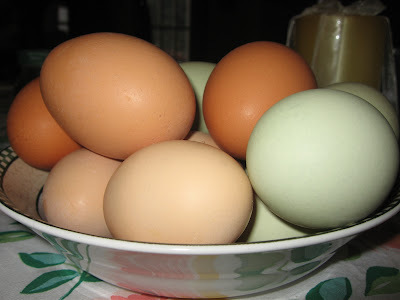 Above are some beautiful eggs that I got from a friends farm. 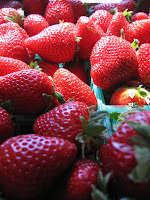 The green ones are so pretty, and I read years ago that they are lower in cholesterol. 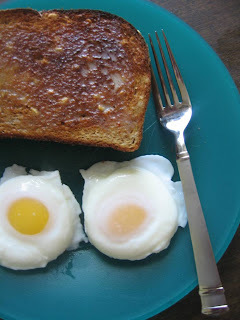 I love poached eggs and I make them a few timas a week so I thought that I would share how I do it. Fill a medium fry pan half way with water and heat to a boil. turn down the heat to a simmer and add your eggs. 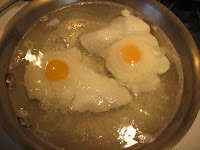 Let them cook until the whites are firm and the yolk is still runny. Serve with wheat toast. 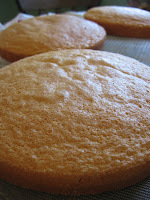 Butter three 8 inch cake pans and dust with bread crumbs. Preheat the oven to 395 degrees (200 C) . sift together the flour and baking powder into a small bowl and set aside. 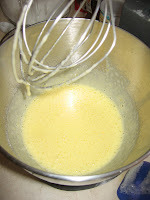 In a mixing bowl, on high speed whip the eggs and sugar until they become light in color and frothy. 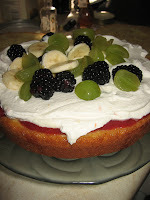 toothpick inserted into the center of the cake comes out clean. 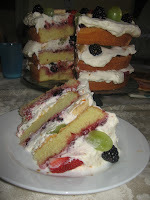 Let the cake cool. cream is whipping add 1/4 C. sugar, vanilla, and zest. 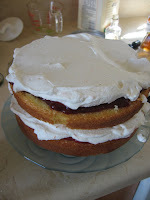 Place one of the 3 layers of the cake on a cake plate, sprinkle the cake with juice or simple syrup (I used a mixture of simple syrup and cheery liquor). 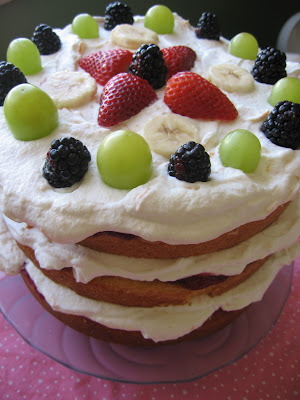 cover cake with whipped cream, and then place a layer of fruit over the whipped cream (I used banana, blackberries, and grapes) repeat these steps with each layer of cake. and serve. 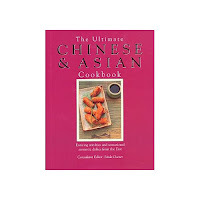 I have a cookbook called The Ultimate Chinese & Asian Cookbook and I have found that almost all the recipes in it are delicious. 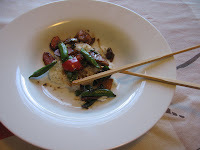 This week I made a version of the Stir-Fried Pork with Vegetables from page 193. I added 1/2 cup red and orange peppers, cut in 1 inch pieces. 1. Cut the pork into thin slices, each about the size of a postage stamp. Marinate with about 1 t. soy sauce, brown sugar, rice wine, and corn starch. 2. Trim the snow peas. thinly slice the mushrooms. Cut the carrots into pieces roughly the same size as the pork. cut the scallion into short sections. 3. 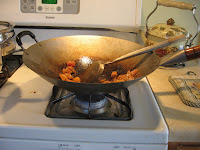 Heat oil in a preheated wok and stir-fry the pork for about 1 minute. remove pork while you cook vegetables. 4. Add the vegetables to the wok and stir-fry for about 2 minutes. Add the pork and some stock if needed. Continue cooking and stirring for about 1 minutes, add the remaining soy sauce . Sprinkle with sesame oil and serve. My 3 year old daughter has so much fun setting up her good so that I can take a picture of that too. Tonight I am posting her dish. 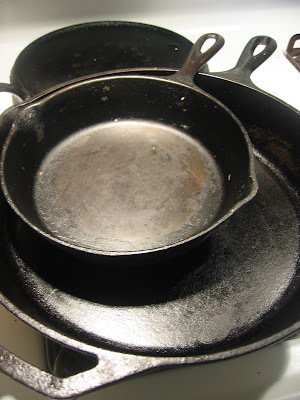 In a large noncreative saucepan, melt butter over medium heat with olive oil. Add onion and carrot and cook, stirring frequently, until softened, 3 to 5 minutes. Add flour and cook, stirring constantly, 1 to 2 minutes without allowing to color. Add tomatoes with their juices, garlic, broth, tomato paste, basil, thyme and bay leaf. Bring to a boil. Reduce heat to low, cover, and simmer stirring frequently, 15 minutes. Remove and discard bay leaf. 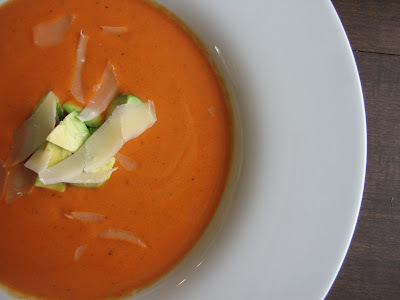 In a food processor or blender, puree soup in batches until smooth. Return to pan and stir in cream. Season with salt and pepper, to taste. Simmer until heated through, 3 to 5 minutes, garnish with avocado and cheese and serve. 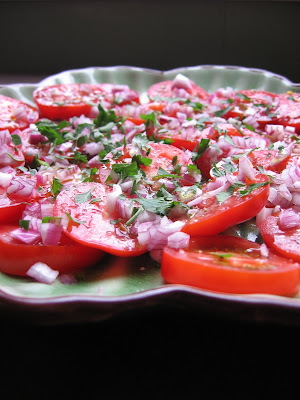 * If using fresh tomatoes: Cut tomatoes in half (quarters for large tomatoes), place them in a bowl and toss with 2 T .Olive oil, salt, pepper, and 1/2 t. rosemary to coat. 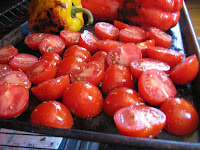 Place tomatoes on baking sheet and place under broiler for about 10 minutes or until they start to break down. Let tomatoes cool, place in a blender and puree, drain tomatoes through sieve. Use in soup. 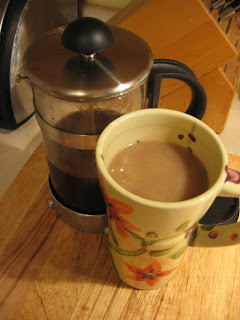 This one is simple and Delicious. Sprinkle with fresh, chopped parsley. 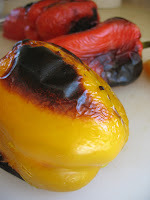 While doing my weekly shopping today there were red peppers at the produce market for $0.99 a pound so I picked some up and roasted them under the broiler. I then peeled off the skin and store them in a jar with olive oil. 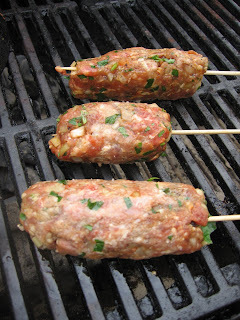 To Serve I lay them out on a plate, drizzle with olive oil, and sprinkle with minced garlic. There were also 1/2 flats of strawberries for $2.99 so I picked some of those up to make a few jars of jam to get us through until they come into season here in Michigan. I washed and Trimmed the Strawberries, cut them into quarters making about 6 cups of berries then put them into a large pan and cooked them until they were liquidy and added about 3/4 of a cut of sugar. 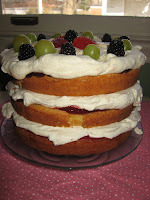 I also added a small amount of Gelatin but I don't think it made much difference. 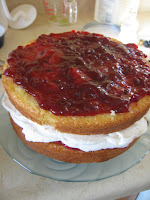 I like my jam a little runny and not very sweet so if you want something more traditional I suggest looking at a traditional recipe. 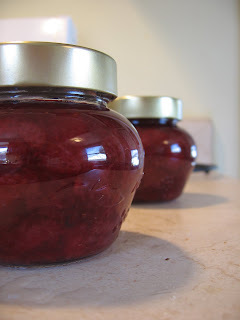 Once the Jam was done I put some jars and lids on boiling water and ladled the hot jam into the hot jars, tightened the Lids and let them set until they sealed. I found a recipe for German Peasant Soup on Lex Culinaria's blog (http://gorgeoustown.typepad.com/lex_culinaria/). However, I had salmon in the fridge, and I really wanted some fish. 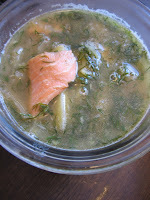 I cut the salmon into chunks and added to the soup in the last 8 minutes of cooking and it was great, even my 3 year old daughter liked it. In the bottom of a soup pot, gently caramelize the onions in olive oil over a medium low heat, stirring occasionally for about 20 or 25 minutes. Meanwhile, quarter and slice the potatoes. Add the garlic to the soup pot and cook and stir for 3 minutes more. Raise the heat to medium high and add the sliced potatoes and pour over chicken stock. Add enough water so that the potatoes are covered by a margin of about one inch. Add in one half of the chopped dill. Place the lid on the pot and allow the soup to simmer over medium high heat for about 30 minutes. Add the salmon chuncks and cook 8 more minutes. Taste the broth and season with salt and pepper to taste. Remove from the heat and stir through the remaining dill. Serve with (or without) dollops of sour cream. We eat this salad with almost everything I make. It is what we call a family staple. 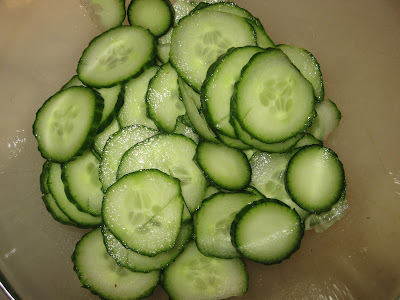 Slice one English cucumber and put into bowl and salt the cucumber rounds. Mix 3/4 cup plain full fat yogurt with 1/3 cup sour cream. Add in 3 minced cloves of garlic and salt to taste. 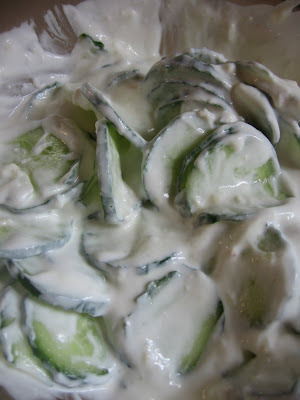 Mix the cucumbers and yogurt sauce together and serve chilled. My husband loves what he calls grilled meats from back home so from time to time I will make something special to surprise him and today it was Tchevapchitchi. Of course I put my own twist on it, but he loved it. 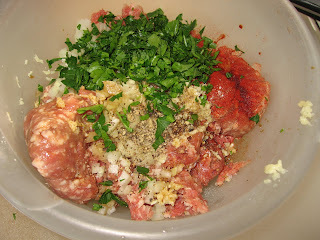 I mix all the ingredients together and form meat mixture onto sausage link shapes. 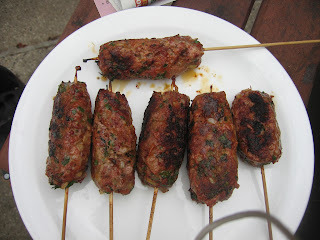 Press a shish kabob skewer in each one. Place each link on a heated charcoal grill and cook to just done. Do not over cook. 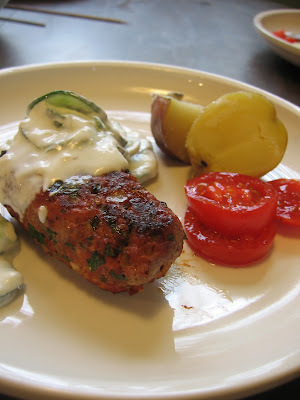 Serve with boiled potatoes and cucumber salad. Pork loin with pears and parmesan cheese- If I have any left, my 20 month old son is eating them like crazy.